This is a must device for video taking, either for lights setup or supplement. Light is emitted constantly and provide a permanent light. This super lightweight 160-piece-LED video light can be used in video taking. Compatible with five different kinds of battery: Panasonic CGR-D16S, Sony NP-FH70, NP-FM55H, NP-F550 and AA battery. Easy to know the battery capacity: press the test button, 4-LED On means battery full, 1-LED On means battery low. There are two filters included with this item, one white filter to soften the light (diffuse effect); the other warm filter to reduce the color temperature. Rotate switch be use to on/off and adjust the brightness. -Hot shoe design can be attached to the video cam or DC. 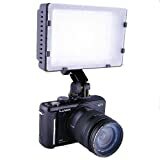 Technical Specification: Power: 9.6W Color Temperature: 5400K (3200K, with orange filter) Illumination: Distance Lux 1m 900 lux 2m 240 lux 3m 120 lux 4m 70 lux Includes : * 160-LED light * White filter,to soften the light (diffuse effect). * Warm filter,to reduce the color temperature. This entry was posted in Discount Photography and tagged 160LED, 1Ds5D6D7D50D60D70D750D600D650D700D1300D1200DNikon, Camcorders, Camera, Canon, D810D100D7100D7200D5500D5300D3200D3300OlympusPanasnicPentaxFujiSony, DSLR/SLR, Light, Video by Ball Photo. Bookmark the permalink.